Chios (/ˈkaɪ.ɒs/; Greek: Χίος, translit. Khíos [ˈçi.os] (listen)) is the fifth largest of the Greek islands, situated in the Aegean Sea, 7 kilometres (4.3 mi) off the Anatolian coast. The island is separated from Turkey by the Chios Strait. Chios is notable for its exports of mastic gum and its nickname is the Mastic Island. Tourist attractions include its medieval villages and the 11th-century monastery of Nea Moni, a UNESCO World Heritage Site. 26 April 1875 - 26 August 1875. The Chian Committee (Greek: Επιτροπή των Χίων) was a committee of Chians, consisting of Ambrosios Skaramangas, Loukas Rallis and Georgios Psychas, which was created to ensure the inclusion of Chios in the newly established Greek state. Also undertook the financial and material support of the Chios expedition (1827-1828). After the destruction of Chios in 1822 by the Ottoman army several of the inhabitants settled in other parts of Greece and Europe. Many of them settled in Syros and engaged in trade. Longed for the liberation of their homeland and worried that Chios would be left outside the borders of the formation of a new Greek state, although it had revolted against the Ottomans and had suffered enough during the revolution. Chios (Greek: Χίος) is the main town and a former municipality on the island of Chios, North Aegean, Greece. Since the 2011 local government reform, it is part of the municipality Chios, of which it is a municipal unit. The municipal unit has an area of 22.823 km2. It is located on the eastern coast of the island facing the Turkish coastal town of Çeşme. The town has a population of 26,850 (2011) and is the administrative capital and main port of both the island and of the regional unit of Chios. Chios town is one of eight municipal units on the island. The city is often locally referred to as "Chora" (Χώρα; literally meaning "country") or "Kastro" (Κάστρο; "castle") to distinguish it from the entirety of the island with which it shares the name. North of Chios lies the suburb of Vrontados, while the Chios Island National Airport and town of Karfas lie a few kilometres south of the centre. Chios (Greek: Περιφερειακή ενότητα Χίου, Greek pronunciation: [periferi.aˈci eˈnotita ˈçi.u]) is one of the regional units of Greece. It is part of the region of North Aegean. The capital of the regional unit is the town of Chios. The regional unit consists of the islands of Chios, Psara, Oinousses and some smaller uninhabited islands (including Antipsara), all in the Aegean Sea. The Chios expedition was an attempt of the regular Greek army and irregular military units for the recapture of Chios island during the final stages of the Greek War of Independence. Chios had participated in the Greek uprising against the Ottoman Empire, but had been captured and its population massacred by the Ottoman fleet in 1822. In the last months of 1827, as independence loomed, the Greek rebels launched simultaneous military operations in Chios, Crete and the eastern and western Greece. This happened because they were very concerned that large areas would remain outside the prospective Greek state, even areas that had revolted and had suffered many hardships during the previous stages of the War of Independence. In 1827, Chian merchants who lived in Syros sent letters to the Greek government begging them to undertake an expedition to regain Chios. The newly formed Chian Committee sent a letter to their fellow Chian, Adamantios Korais, asking him to find basic resources (like water and food) for the campaign. The Vice-gubernatorial Committee that administered Greece until the arrival of Governor Ioannis Kapodistrias ordered Sir Richard Church to assign the task of recovering Chios to Charles Nicolas Fabvier in August 1827. At first, Fabvier didn't act, but soon began organizing an expeditionary force of 600-700 men, mostly from the regular army, as well as a small artillery force (4 field guns, 6-7 siege guns, 3 mortars). The force was complemented by 200 cavalry (although less than a quarter actually had horses), which did not arrive until November, and over a thousand irregulars from Central Greece and Chian refugees. The expedition assembled at the island of Psara, near Chios, which likewise had been captured and ravaged by the Ottomans in 1824. The expeditionary force landed on Chios on 17 October, facing the Ottoman garrison of 2,000 men under Yusuf Pasha. The next day, the Greek fleet under Thomas Cochrane offloaded further 5 mortars and 1,000 shells. The Greek expedition had already caused the reaction of the Great Powers, whose admirals in the Aegean on 12 October had issued a proclamation opposing any renewed uprising on Chios. Undeterred, Fabvier defeated the first Turkish forces that opposed him, forcing them to shut themselves in the medieval Castle of Chios, which he laid siege to. The siege was incomplete, however, as Fabvier lacked a fleet to blockade the fortress from the sea as well. Α serious problem that Fabvier was facing was the order from the French admiral Henri de Rigny to quit and leave. Fabvier replied that he only took orders from the Greek government. On 5 November 1827 he was reinforced by the cavalry under the philhellene Portuguese colonel Antonio Figueira d'Almeida. Few days later the famed mine-digger Konstantinos Lagoumitzis came to the island in order to help undermine the walls of the castle. At the same time, Fabvier launched raids on the Anatolian shores, and prepared a large-scale attack on the port of Çesme, in conjunction with a fireship attack under Konstantinos Kanaris against the ships in port there. In the event, string winds prevented the execution of this operation. A similar raid against the environs of Smyrna was thwarted after the brig Sotir sunk in a storm on 6 January 1828. On 12 January, the Turkish garrison launched a strong sortie against the poorly guarded bastion of the Greek siege lines, and soon made rapid progress until stopped by the strong resistance of irregulars under the kapetanios Gekas, who bought precious time for the intervention of the 2nd Regular Battalion, which drove the Turks back. Fabvier himself, seeing Turkish banners on his trenches, took the 3rd Battalion and recaptured the original bastion the Turks had captured. The Turks lost 240 (according to other sources as many as 524) men, but the victory was not decisive as the blockade remained loose. The new governor, Kapodistrias, sent money and reinforcements to the island and ordered the fleet to assist, but the situation was critical: the Chian Committee had ceased providing pay and supplies to the troops, while the exactions of the irregular fighters exacerbated relations with the locals. Finally, on 27 February 1828, an Ottoman squadron drove away the Greek ships aiding the siege. On the next day, the escorted 3,000 troops from Çesme across the sea to Chios. The first attempts to land elsewhere on the island were thwarted by the regular Greek troops, forcing the Ottomans to land in the fortress. Their arrival led to the collapse of morale of the Chian population, many of whom fled the island. Fabvier decided to lift the siege and withdraw, and in early March, he and his men were evacuated from the island. USS LST-35 was an LST-1-class tank landing ship of the United States Navy built during World War II. She was transferred to the Royal Hellenic Navy on 18 August 1943, before being commissioned into the USN, and was renamed Chios. Joachim IV (5 July 1837 – 15 February 1887) was Ecumenical Patriarch of Constantinople from 1884 to 1887. He was born in 1830, in Kallimasia, Chios. Mastic (Greek: Μαστίχα) is a resin obtained from the mastic tree (Pistacia lentiscus). In pharmacies and nature shops, it is called Arabic gum (not to be confused with gum arabic) and Yemen gum. In Greece, it is known as tears of Chios, being traditionally produced on that Greek island, and, like other natural resins, is produced in "tears" or droplets. Mavrocordatos (also Mavrocordato, Mavrokordatos, Mavrocordat or Mavrogordato; Greek: Μαυροκορδάτος) is the name of a family of Phanariot Greeks originally from Chios, a branch of which was distinguished in the history of the Ottoman Empire, Wallachia, Moldavia, and modern Greece. The family – whose members were given a status equal to a Prince of the Holy Roman Empire and later became hospodars – was founded by the late-Byzantine noble (and merchant) Nicholas Mavrocordatos (1522–1570) from the island of Chios. Nea Moni (Greek: Νέα Μονή, lit. "New Monastery") is an 11th-century monastery on the island of Chios that has been recognized as a UNESCO World Heritage Site. It is located on the Provateio Oros Mt. in the island's interior, about 15 km from Chios town. It is well known for its mosaics, which, together with those at Daphni and Hosios Loukas, are among the finest examples of "Macedonian Renaissance" art in Greece. For the lunar crater, see Oenopides (crater).Oenopides of Chios (Greek: Οἰνοπίδης ὁ Χῖος) was an ancient Greek geometer and astronomer, who lived around 450 BCE. Oinousses (Greek: Οινούσσες, alternative forms: Aignousa (Αιγνούσα) or Egnousa (Εγνούσα)) is a barren cluster of 1 larger and 8 smaller islands some 2 kilometres (1 mile) off the north-east coast of the Greek island of Chios and 8 km (5 miles) west of Turkey. Administratively the islands form a municipality within the Chios regional unit, which is part of the North Aegean region. The principal town of the islands and seat of the municipality is also called Oinousses. Oinousses has a small resident population, living primarily in the islands' town of Oinoússes (pop. 792), and a recently built monastery. The town is centred on a square and a small port; it includes a school, several churches, a Naval high school and a maritime museum. The only other populated settlements are Kástron (pop. 29) and Aspalathrókampos (5). Pasas or Panagia (Greek: Πασάς, Παναγιά) is a small Greek island of the Oinousses complex in the Aegean Sea, located east of Oinousses, the largest island of the complex. Administratively, Pasas and the rest of the islands form the Oinousses municipality within the Chios regional unit. With an area of 2.448 km2, it is the second largest island of the complex. According to 2011 census, the island is uninhabited, although a guard of lighthouse lives often there and a military garrison is permanently stationed on it. The most notable building on the island is the old lighthouse which was built in 1863 and has a height of 8.5 meters. Since 1995, the lighthouse has been converted to solar power and it keeps a permanent staff. 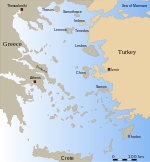 Psara (Greek: Ψαρά, Psará, Greek pronunciation: [psaˈra]; formerly known as Ψύρα, Psyra, or Ψυρίη, Psyriī) is a Greek island in the Aegean Sea. Together with the small island of Antipsara (Pop 4) it forms the municipality of Psara. It is part of the Chios regional unit, which is part of the North Aegean region. The only town of the island and seat of the municipality is also called Psara.Psara had 448 inhabitants according to the 2011 census. It has a small port linking to the island of Chios and other parts of Greece. In Greek tradition, the sphinx has the head of a human, the haunches of a lion, and sometimes the wings of a bird. It is mythicised as treacherous and merciless. Those who cannot answer its riddle suffer a fate typical in such mythological stories, as they are killed and eaten by this ravenous monster. This deadly version of a sphinx appears in the myth and drama of Oedipus. Unlike the Greek sphinx, which was a woman, the Egyptian sphinx is typically shown as a man (an androsphinx (Ancient Greek: Ανδρόσφιγξ)). In addition, the Egyptian sphinx was viewed as benevolent, but having a ferocious strength similar to the malevolent Greek version and both were thought of as guardians often flanking the entrances to temples.In European decorative art, the sphinx enjoyed a major revival during the Renaissance. Later, the sphinx image, something very similar to the original Ancient Egyptian concept, was exported into many other cultures, albeit often interpreted quite differently, due to translations of descriptions of the originals and the evolution of the concept in relation to other cultural traditions. Sphinxes depictions are generally associated with architectural structures such as royal tombs or religious temples. The oldest known sphinx was found near Gobekli Tepe at another site, Nevali Çori, or possibly 195 kilometres (120 mi) to the east at Kortik Tepe, Turkey, and was dated to 9,500 B.C. The Massacre at Chios (French: Scène des massacres de Scio) is the second major oil painting by the French artist Eugène Delacroix. The work is more than four meters tall, and shows some of the horror of the wartime destruction visited on the Island of Chios in the Chios massacre. A frieze-like display of suffering characters, military might, ornate and colourful costumes, terror, disease and death is shown in front of a scene of widespread desolation. Unusually for a painting of civil ruin during this period, The Massacre at Chios has no heroic figure to counterbalance the crushed victims, and there is little to suggest hope among the ruin and despair. The vigour with which the aggressor is painted, contrasted with the dismal rendition of the victims has drawn comment since the work was first hung, and some critics have charged that Delacroix might have tried to show some sympathy with the brutal occupiers. The painting was completed and displayed at the Salon of 1824 and presently hangs at the Musée du Louvre in Paris.